Charity festival, 1913. 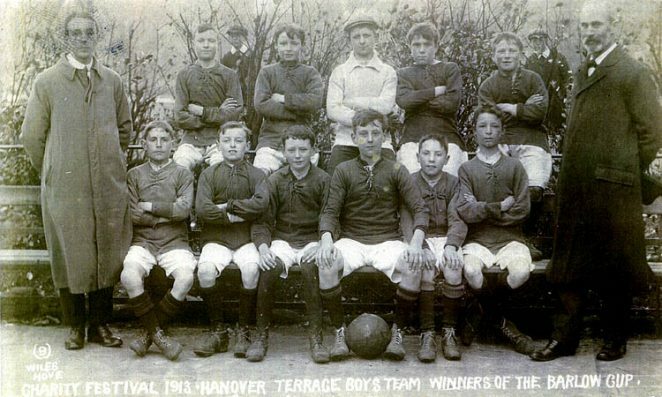 Hanover Terrace Boys Team, Winner of the Barlow Cup. Photographer: Wiles, Hove. Image scanned with kind permission from the private collection of Jacqueline Pollard. I attended this school from 1955 until 1961. In 1955 it was called Brighton School of Building and Engineering (B.S.B.E ) but before I left it was renamed Brighton Secondary Technical School. I revisited recently and sadly see that it has been demolished and replaced with housing. The headmaster during this time was a Mr Downing and his deputy was Mr Chappel. The school boasted of being one of only two or three schools in Brighton that had a rugby team and used the playing fields at East Brighton Park for recreational activities. As far as I can remember games day was on a Friday and this meant catching the number 44 trolley bus at the bottom of Elm Grove. I cannot be sure of the exact address but there was a sweet shop on the east side of the road which we affectionately called ‘our tuck shop’. Sadly that too no longer exists. Future contributors may also be able to include their memories, information and pics. I went to BSBE between 1953 and 1959. I was known as ‘The Goof’ as I had the same name as the headmaster. I was keen on cycles, used to go rock climing at High Rock and Groombridge. Mr Pope the history teacher broke his ankle there. Mr Noble was the Maths Teacher. It was a small school – only about 300 pupils. I also attended the BSTS from 1968 to 1973. Mr Wilson had taken over from Mr Downing but Mr Chappell was still assistant head. The year after I left, the school amalgamated with Patcham Fawcett. I went to BSTS from 1970 to 1975 – Ron Wilson was Head and a fine job he did!! I went to BSTC from 1970 till 1975. Ron Wilson was head. Tom Collins was in my class and I also remember the name Graham Maskel. I was there between 1960 and 65. I remember Mr. Downing (Goofy), Mr Chappel, Mr Pope, Mr. Walsh, Mr Lowry (French), Mr Mc?? (Art), Mr Steel (Maths) plus many others. I even remember Peter Stockbridge (English and RE) now occasionally seen on TV. Served my “sentence” fom ’65 – ’70. In addition to the above I recall Bob Leale (Maths), “Harry” Homer (History) and I am pretty sure that Peter Vincent, who is now a BBC comedy script writer sat in as an English teacher for a while. Hey hey! I was at this school too. 1970-1976. I remember Peter Bluck. You live(d)? on Hartington Terrace, or Place, and had a gorgeous looking older Sister, Susan as I remember!! I was on Bernard road. The role call went… Ambler, Ashton, Ashby, Bantock, Barry, Bluck, Bottomley, Brown, another Brown, then me!! I’ve lived in the USA since 1980. I was there from 1970-1975. I think I went to Kevin’s house every lunch and his mum gave us iced buns. I have one of those long panorama photos taken in 1973 – will scan and post. I attended the school between 1970 and 1975. I can remember you all. Remember also the History master Ron Newbold and an English master called Macneff. There was also Bill Rex the deputy Head. If I remember he was pretty frightening and I did receive a few lashes from his cane. Also if I’m not mistaken I think our Mums used to run the Tombola at our open days. Fond memories – keep in touch. Great to see that there are a few of us still about. I found this picture while clearing out the other day: http://infinisol.com/images/BSTS. Roger, I believe our mothers still see each other once in a while. Bob Miles, the Art Master was Mr McKinley, Chem Master, Mr Moran aka Lemon, Mr Spud Taylor woodwork and Mr Parfitt and Phil Best P.E. Sure brings back memories. ’61 – ’65 expelled. Best mates Joey Holland and Chris Dowsing both RIP. Kevin, where in the US are you? e-mail me. Also I will be in the UK first two weeks of May – anyone interested in getting together? Anyone else from class 3X of 1951? Our class master was McKinley, other teachers were Taylor, Chappell, Pope, Parfitt, Bullock, Hargreaves and Behar, the Head was Downing. Classmates included Dave Pierce, Dave Short, Dave Court, John Tree, Chris Beard; anyone remember these! Hi Michael, I only just noticed you live here in the US too. I moved here in 1980 and got into the restaurant business. I owned four restaurants at one point in Orange County, California. I lived in Newport Beach until May of ’04 when I got very sick and spent three months in the hospital. After that I sold the restaurants and my houses and retired to the desert. I now live in Cave Creek, Arizona. I was at the BSBE 1953+, I recall that the leaving age was 16 but I elected to leave aged 15. Mr Parfit the metalwork master did all he could to convince me to stay, he failed and said I would regret it for the rest of my life. I started work for H A Waller & Sons metalworkers in Brighton eventually to become Managing Director. Mr Parfit was one of my customers and bought much of the metal from me for use in his department. I was there for 31 years and left to buy my own business in Portslade, not too many regrets there! Now retired to Torquay. Hi Peter, Roger, Kevin and Tom. Yeah ’70 – ’75. I went back after about ten years and couldn’t believe how small the yard was! Amazed too, that pictures of circa ’57 have the same teachers, Mr Chappel, Mr ‘Dolly’ Parfit, and Mr Hargreaves. Do any of you remember when Anthony Goldsmith gashed his leg open in the woodwork lesson? It’s a long time guys, but good memories. My husband is the John Tree mentioned by Dave Brazier who was in Brighton Tecnical College, from there he went to work at Alan West and left there to join the Fleet Air Arm.He married me, a Welsh girl from Pembrokeshire. When he left the navy he worked in electronics but then went into the building trade setting up his own business. He always says that his time at BTC gave him a good grounding for what he does now, yes he is still working. We vist Sussex often to see his sister Margaret who now lives in Worthing but we love to go into Brighton to look up his old haunts and fishing venues. Best wishes to you Dave and any one else who remembers him. I went there in 1953 when it was BSB&E to 1957. We lived on Southdown Ave and I rode a bicycle daily to school. I remember Mr Ben Chappel, who taught Technical Drawing and was assist. head to Mr(Goofy) Downing. Downing taught Economics and Divinity. Other teachers I recall were: Price – Geography, Behar – French, Pope – History, (Spud)Taylor – Woodshop, Hargreaves – Brickwork, and Parfit who taught lead beating and plumbing. Our science teacher’s name escapes me at this moment, but we called him Boffin. I remember he wore a white lab coat and smoked a pipe, which he would place in his pocket. One day smoke was coming from his pocket and the class was trying to get his attention to it as he tried to ignore us. Very funny. Classmates I recall include Mike Bristow, Edward Alexander and .. hmm, I need help here! Later I went on to Brighton Tech College and subsequently spent much of my life in civil and construction engineering and management both in the UK and USA. Thank you BSB&E, a unique and excellent school. I am now retired and live in Florida USA. Hi Vic, good to hear from you. I will e-mail you as soon as possible. I migrated to Australia in 1964 and don’t know what happened to David Marne. Hi John Tree, You may not remember me, but I was in 4x with you at BSBE, and also St Lukes Terrace Juniors before that. If I remember correctly, you are a cousin of Rodney Wheeler who was also at St Lukes Terrace Jnrs. After closing down secondary technical schools with the introduction of comprehensive schools, it is proposed to bring them back again because of the shortage of skilled engineers etc. I am sure that all of us who went to BSBE, later BSTSBE, have known all our lives after leaving the school, that we knew all along that it was a huge mistake in closing them down at that time. What memories some of the comments bring back. I was there from 1955 to 1961 and can also remember names of teachers and classmates. Mr Pope taught French and history, but best at French was certainly Mr Behar. His favourite English phrase seemed to be “Are you mad” when he did not like your answer or pronunciation. Mr Hargreaves taught brickwork and was also the football coach. His son Alex was also at the school. Does anybody remember the two Woods? ‘Big and Little’. Little was Brian and I can’t remember the name of Big. In the late ’50s a new PE Teacher came and introduced Scottish Country Dancing, which we put on as a display at the end of the school year. I saw and talked to Mr Stockbridge in Brighton about 5 or 6 years ago, although he said he remembered me, I don’t think that he did. ‘Freddie’ Freyn was maths. Does anybody remember Paddy Rea, a really good foootballer and captain of the school team? Sadly he passed away about 4 year ago and was given a great send off by Sussex Police where he was employed for many years. I was told that a lad named Housego. who lived at the bottom of Elm Grove had gone into the Diplomatic Corps and was quite successful. I was sad to see that the School had been demolished and replaced with housing, but I suppose that is progress. Hi Clare Cornes. I am Ian Waller. my dad is John Waller, one of H Waller’s sons. I have many photos of the Waller family. if you want any info please get in touch. cheers Ian. Hi Colin Wares, I don’t know if you remember me but I left the same day as you. I remember that you lived by the railway viaduct, which I visited a couple of times. I lived out in the sticks at Wivelsfield so I used to leave home at 7am and arrived home at 5.45pm. If I boxed or ran after school had finished other boys would take me to their homes to wait for the evening events as it was not possible to get home and back to school again in time. You, like me were in the gymnastic team which gave exhibitions after school hours, so we were involved with Mr Weedel for practices etc. I too was told by the masters that I would regret leaving to pursue a career with racehorses. I worked in this industry from age 15-65 when I retired – with no regrets. During this period I was a jockey, Head lad and trainer, being Head lad to the trainer of the 1967 Grand National winner Foinavon, which there has now been a book written about. The author is David Owen published by Wisden Press. It is good to hear that you were successful in your chosen career. Hi Colin Hemsley. I remember you well, also Dave Berry and Ian Parsons who both commuted by train from your neck of the woods. How strange to remember the BSBE with affection having spent our last days wanting to get away from there. I had several contact with ex BSBE boys throughout my working day. My business was allied to the building trade and many companies in the Sussex area were managed/run by ex-pupils. Roy Weedle became a buyer for The London Nameplate Co and was a customer of mine for several years and also for repairs to his sailing boat. Fantastic to hear of your involvement with the Grand National winner – I guess it doesn’t get any better than that in the racing world. I have only just stumbled on this site for Hanover Terrace School and I am a bit confused. There is much more info about BTSBE school on separate pages. If you go to Places..Schools..Hanover Terrace School there are about a dozen icons leading to lots more pics and comments, including photos of Coronation window and full frontal of the dreaded main entrance and the school yard. Regarding posts on this page, I learnt from Dave Brazier’s daughter in January this year, 2017, that Dave passed away on the 4th January, 2017. We were often exchanging emails, especially aviation ones, his daughter picked up one of mine to pass on the sad news.